Republican Senate Candidate Roy Moore campaigned in Alabama Tuesday night, just one week out from the election. 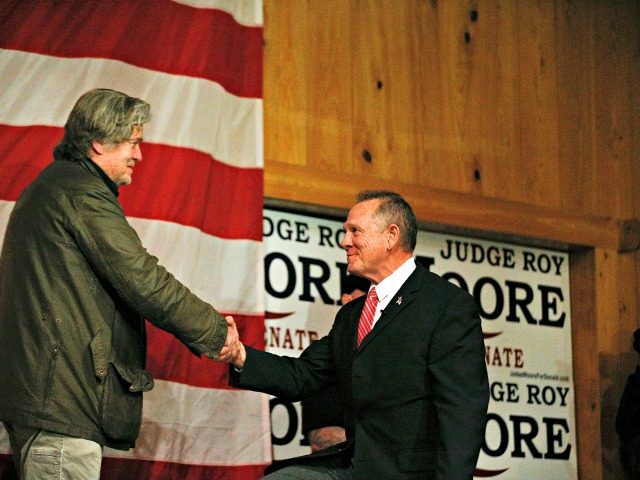 Moore spoke to the audience after his supporters, including Breitbart News chairman Steve Bannon, rallied the crowd to finish the fight against the establishment political system in Washington D.C.
“We’ve got to go back to God, we’ve got to go back to restore the morality of this country,” Moore said. He acknowledged that he had been attacked on all sides in the election, but would continue to fight on their behalf. Moore read from Patrick Henry’s “Give Me Liberty or Give Me Death” speech, putting the country’s current struggle in the same lens — patriots struggling against an overbearing federal government that was ignoring the issues important to them. Moore cast the race in terms of an ongoing battle against the establishment in Washington to support President Donald Trump’s agenda. Moore promised to stand for the sanctity of marriage, the unborn, and belief in God and religion and to oppose leftist issues like allowing transgender people into bathrooms of their own choice and bringing transgender soldiers into the military. He also condemned Roe vs. Wade as a violation of the Constitution and vowed to fight for pro-life issues. “I will never backtrack on that,” he said. Moore recalled that Donald Trump’s election lifted a great burden from his shoulders after he realized that America had another chance to succeed. He also vowed to support Trump to stop illegal immigration, build the wall, fix existing trade deals like NAFTA, and repeal Obamacare.